As you can imagine, the annual race between LA and Honolulu schools even the best of sailors...which is why the best sailors never stop learning. Regardless whether you are a racer or a cruiser, amateur or pro, here are some great lessons everyone should read. 2015 Transpac: Del Olsen smiles in from of a beautiful sky during the 2015 Transpac. Taking one for the team can be tough, but the scenery is a great consolation! Photo by Jenn Virskus. The 2,225-nautical mile Transpac from Los Angeles, CA, to Honolulu, HI, is an ultra-marathon of a regatta. And as with any sporting event of this caliber and difficulty, it is a test of not only on-the-water sailing skill, but also persistence, preparation, emotion, and will power. 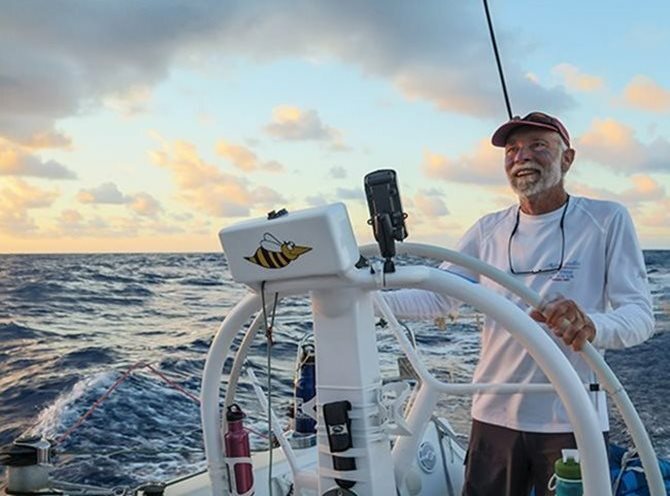 With highly uncertain weather conditions; a tropical storm to the south and the mother of all ridges to the north; the 2015 Transpac was particularly challenging for navigators and crew alike. From the rookie boats like Adrenalin—it was the first ocean crossing for the majority of the crew including the navigator—to seasoned champions like three-time winner Grand Illusion, there was a lesson to be learned lurking along every layline. You can’t give up, you have to stay focused the entire race … The course went much further north than we’ve ever gone before—I’ve only done the one—but with light air for three days, in the first three days we only made 150 miles. So we had to be quite patient. The last day of the race we hit a really bad squall that sent us off in the wrong direction. We were all sort of stunned by that and we had to regroup and get back in the game. We just went back to our routine. Routine is king. Erik Gray, Skipper of the SC50 Allure – first place in Division 5 by just over two minutes! Lesson 2: You’ve got to have the right sail for the conditions! We were in the first start on July 13. We cleared the west end of Catalina Island, and our strategy was to go southwest, but the charts said don’t go southwest no matter what. We got pounded for two days with Atlantic Ocean-style waves—a frequency of every two to three seconds and 12-feet-high. We had only one sail onboard that could deal with that tough situation and it was the jib top that Quantum built for us right before the race. Will Paxton did a fabulous job; George Szabo did the service end of it. It powered us through a day and a half of going through a horrendous sea state that no other sail on the boat could have done. It enabled us to be in a position when we came out of that to go like hell. Our hats off big time to Quantum for making a fabulous jib top. Del Olsen, Co-Skipper and Watch Captain of the SC50 Adrenalin – finished seventh in Division 5. Sam Heck of Quantum SoCal, Tactician on Rick von Heydenreich’s SC52 Paranoia – fifth in Division 5. Lesson 5: Try not to be too conservative, but also don’t be over early! Bill Durant, Skipper/Owner of the SC52 Relentless – third to finish in Division 5 and corrected to fourth. "The modern boats with asymmetrical kites really put a premium on always staying pressed up a little bit as opposed to the traditional squared-back running mode … We used to sail with eight people and square the pole back and we always had good drivers and we were very efficient at running and sailing deep. The other boats with bigger budgets and more time went about learning how to sail better and spent time with the designers, ratings, and sail inventory, and started sailing with bigger crews at hotter angles. In 2013 we didn’t have an answer to that. This year we put it upon ourselves to change our mode a little bit; to sail the boat hotter to its polars, and it was faster. Will Paxton of Quantum Pacific, Watch Captain on James McDowell’s SC70 Grand Illusion – winner of Division 3 and the overall Transpac title. This equals the 88-foot Lurline for most wins; Lurline won the first two Transpac races in 1906 and 1908; its third win came in 1912. You can find all kinds of great information about 2015 Transpac, including a full list of results, here!